Mobile phones have become as ordinary and everyday as a purse or wallet, and now we wouldn’t go anywhere without one, but it hasn’t always been this way. In fact, it was only 30 years ago that the first mobile telephone call was made, and the network used was none other than Vodafone. It was Vodafone that kick-started the UK’s mobile phone revolution. In early January 1985, comedian Ernie Wise stood in Trafalgar square in London, and made a call on his mobile phone, to a building in Newbury High Street. O n the ground floor of that building was an Indian restaurant, but above it lived a small start-up company called Vodafone. The company comprised of 5 employees who had just made history by creating the network that allowed the UK’s first ever public mobile call to be made. However, that wasn’t really the first cell phone call. It was Michael Harrison, the son Ernest Harrison (who was once the Vodafone chairman), who first tested the system by calling his dad at 12:00am on January 1st 1985. Nevertheless, for the first time ever, Britain had a mobile network. However, both the network and the phone hardware bore little resemblance to those we use today. Neither did the cost. In 1985, a Vodafone handset cost between £1,500 and £2,000, some of these phones weighed as much as a small dog and most of them needed antennas to even get a signal. Fast forward 30 years and Vodafone is operates in over 30 countries and has coverage partnerships set up with different companies in over 40 more countries. They have almost 360 million customers all over the world and around 19 million in the UK. 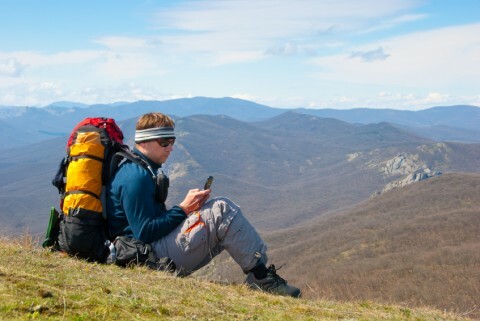 Furthermore, the early challenges of “coverage” are a distant memory, it’s connectivity and speed that that challenge them now, and Vodafone aims to have 4G coverage for 98 per cent of the UK population by the end of this year. They’ve also announced plans to provide network coverage in the Euro tunnel. It’s fair to say that Vodafone has been very successful over the years and is still going strong. To celebrate the 30th anniversary of the UK’s very first phone call, they decided team up with Paul Saville, vice-president of experience at Wasserman Media Group, to take us back to where it all began – the 80’s. The 80’s era provides a lot of nostalgia for many people, and so those at Vodafone decided to create a 1980’s-themed street in Covent Garden. The idea behind the activation was to bring to life the functionality of the smart phone, but back in the 80’s. The event was kicked-off in style by 80’s icon – David Hasslehoff. He wheeled into town in his iconic talking car KITT, and marked the beginning of a three day extravaganza, that included a Spotify Records store, a Now TV VHS shop, the 4G Arcade, a 1985 version of a Vodafone store and a news agents kiosk – called Newbury News. While there are no plans at the moment for any other events for the #30yearsvodafone campaign, Vodafone say they’ll continue to look for opportunities to continue the celebrations throughout 2015. So keep your eyes peeled.